Kofi showed heart in the WWE Championship match at Elimination Chamber. Well, WWE Elimination Chamber has just concluded and while the show was compact with only 6 matches, it was action-packed. Also, WWE got most of the things right for the event- Finn Balor winning the Intercontinental Championship, Sasha Banks and Bayley winning the inaugural Women's tag team championship. And it would not be wrong to say that WWE has finally started listening to the fans. While the show saw the conclusion of a few feuds (Finn Balor vs Bobby Lashley, Ruby Riott vs Ronda Rousey) it also laid down the breadcrumbs for a few new feuds and storylines. Given that WWE Fastlane is scheduled for March 10, we might see WWE converting these feuds into potential matches for the event. So, without further ado, let's take a look at 3 feuds that the Elimination Chamber laid the foundation for. Braun Strowman faced Baron Corbin in a No Disqualification match at Elimination Chamber. While Strowman was dominating the proceedings in the early parts of the match, the equation soon changed when Bobby Lashley and Drew McIntyre decided to interfere in the match. 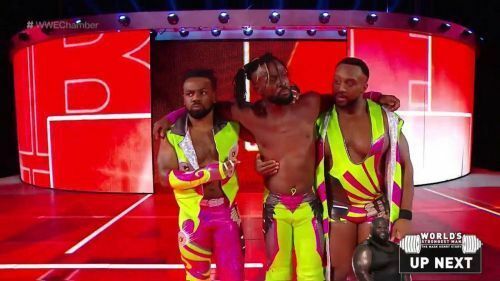 Yes, the trio then completely decimated Strowman to hand over a cheap victory to Baron Corbin. Thus, a potential feud between Strowman vs Drew McIntyre, Lashley and Corbin looks totally on the cards for the coming weeks. WWE could then add Kevin Owens and Finn Balor into the feud to make it a 3-on-3, however, given Strowman has lost all his momentum in the last few months, WWE Creative could just go on with a 3-on-1 handicap match for Fastlane, if they decide to make him look invincible, in order to regain his lost momentum.